For crispy skin, dry it really well and season with salt and wait until the oil is very hot (but not smoking) before adding the fish. Also, do not crowd the pan. Leave it skin-side down for at least 5 minutes before turning, and do not turn before the skin is truly crispy. 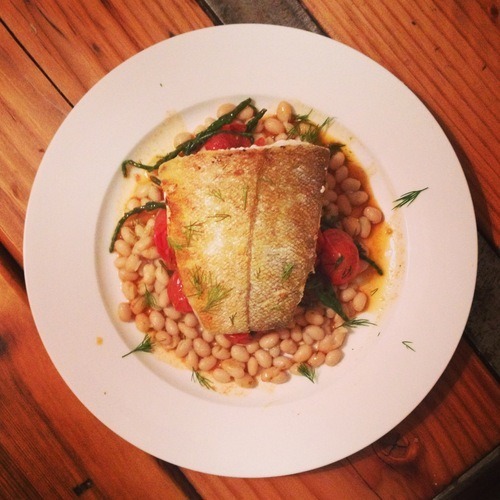 This was served with a mix of softened cherry tomatoes cooked in a small sauce pan in olive oil, samphire (which takes around 4 mins), chopped dill, a garlic clove (to be removed later) and a squeeze of lemon – and seasoned white beans with olive oil. For 2. Pre-heat the oven to 180c. Chop 2-3 few medium sized tomatoes and add to a pan with a good slug of olive oil, a teaspoon of smoked paprika, ½ tablespoon of red wine vinegar, and a pinch of cayenne. When soft, taste for seasoning and add salt as desired. Stir in a tablespoon of fresh chopped coriander. Spoon the mix into half a Romero pepper and add to the oven in a baking tray. In the meantime, add a clove of garlic, slightly bashed, with skin on to a few tablespoons of yogurt with a good pinch of salt and a drizzle of olive oil and set aside. Remove the pepper from the oven when the Romero is soft, which shouldn’t take much more than 10 minutes as the flesh is quite thin on this variety. Fry an egg (add a lid to the pan for 30 seconds to ‘set’ the top of the egg, if you like it so). 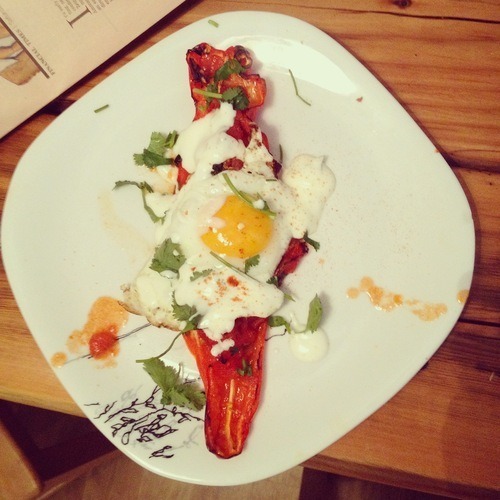 Serve the egg on top of the pepper, with a spoon of the yogurt mix and more fresh coriander and a pinch of paprika. This was eaten with toast. 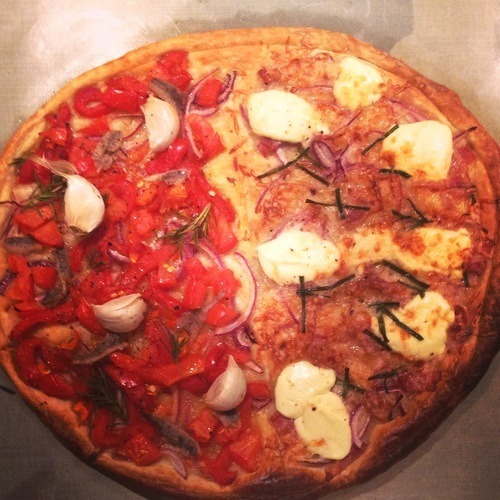 One half of this pastry circle is: Smoked bacon, finely sliced red onion, mascarpone, parmesan and chives. The other half is: Roasted slices of red pepper, anchovies, whole garlic cloves, cherry tomatoes, sliced red onion, rosemary. Score 1cm in from the outside of the tart with a knife. Add the toppings. Bake in a medium oven on a baking sheet until crisp.